The Miview CND filter seems like the ideal accessory for landscape photographers and videomakers. Using patented technology, the filter combines a circular polarising filter and a variable ND filter in the same screw-on lens attachment. Launched at Photokina 2018 , the two-in-one filter measures just 10.1mm thick, and weigh around 40g. 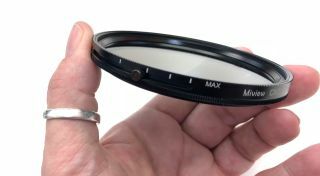 Turn the front part of the filter and you get the usual polarising effect – commonly used for eliminating reflections from water and shiny surfaces, and for boosting blue skies. Meanwhile, two knobs on either side of the filter allow you to adjust the neutral density effect can be used to adjust the amount of light transmitted. The ND effect is commonly used for extending shutter speeds, to blur water, say; or by videographers to allow the use of wide apertures in bright light. The variable ND can be steplessly adjusted from one-stop to five stops of darkening (ND2 to ND32). 72 different coatings are used on the lens, which help prevent color deviation and glare – as well as resisting scratches, grease and water. The filters will be available in the following thread diameters: 82mm, 77mm, 72mm, 67mm and 58mm. The price has not been set, but the filters will be around $400 each when they go on sale next month.